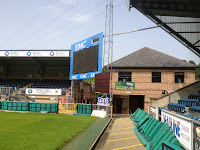 Wycombe Wanderers FC are a football club who come from High Wycombe, a large market town noted for its light industry and particular furniture making, which is located twenty nine miles north west of London. 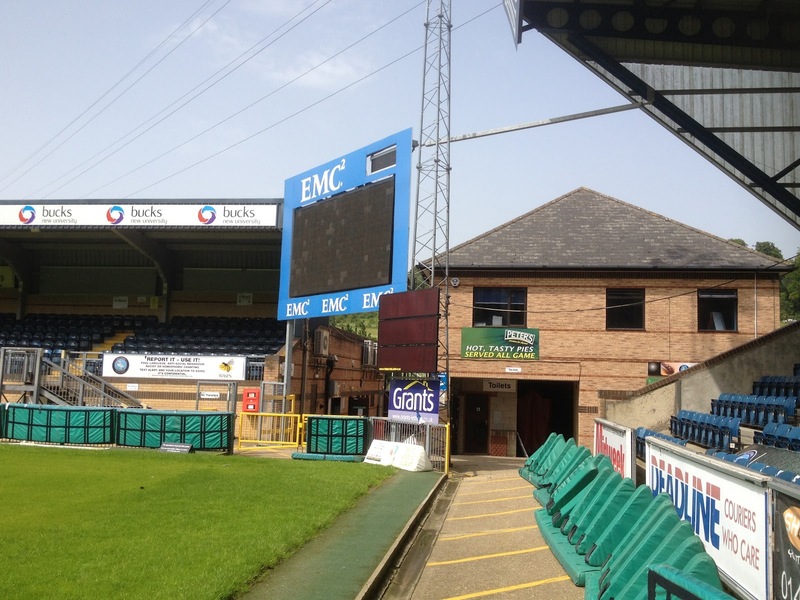 The club, who were formed in 1887 is nicknamed 'The Chairboys' from the furniture making connection. The club were formed at a meeting at the Steam Engine public house in Station Road, with the majority of the team consisting of lads who played for North Town Wanderers who had started playing in 1884. Games were initially played at The Rye to the east of the town centre, before moving to the Cricket Ground. In 1894 they began playing at Spring Meadow and two years later the club entered the Southern League. 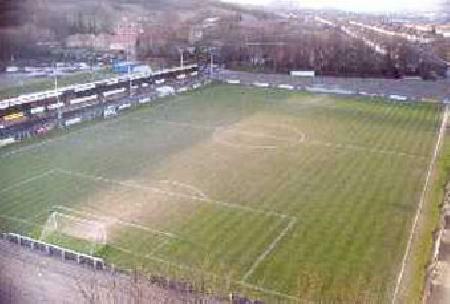 Wanderers old Loakes Park home. Spring Meadow was taken over by the London Marylebone railway line within a year, so with the help of Lord Carrington they were given use of Loakes Park. The Southern League proved hard going for the club as it remained amateur playing against professional sides and having to travel far and wide to games. In 1908 they left to join the Great Western Suburban League to boost income from more local derbies. The club suffered owning to an industrial strike affecting attendances and then World War I, but the regrouped and also joined the Spartan League, which soon became their senior priority. In 1921 Wanderers were admitted into the Isthmian League. 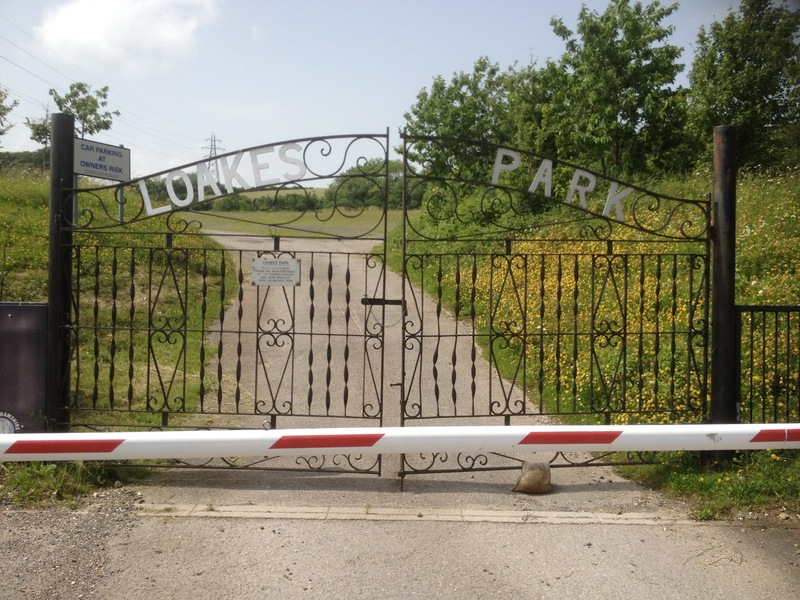 Work was done to improve Loakes Park in 1923 and four years later a fifty years lease was signed as the club aimed to become the finest amateur club in the country. In 1931 Wycombe lifted the FA Amateur Cup, beating Hayes by a goal to nil in the Highbury final. The money from the cup run was spent on a cover over the side terracing at their home ground. On 19th April 1947 Frank Adams handed over the deeds for Loakes Park after purchasing the ground for the club from Lord Carrington. In 1950 The Chairboys reached the semi final of the Amateur Cup. 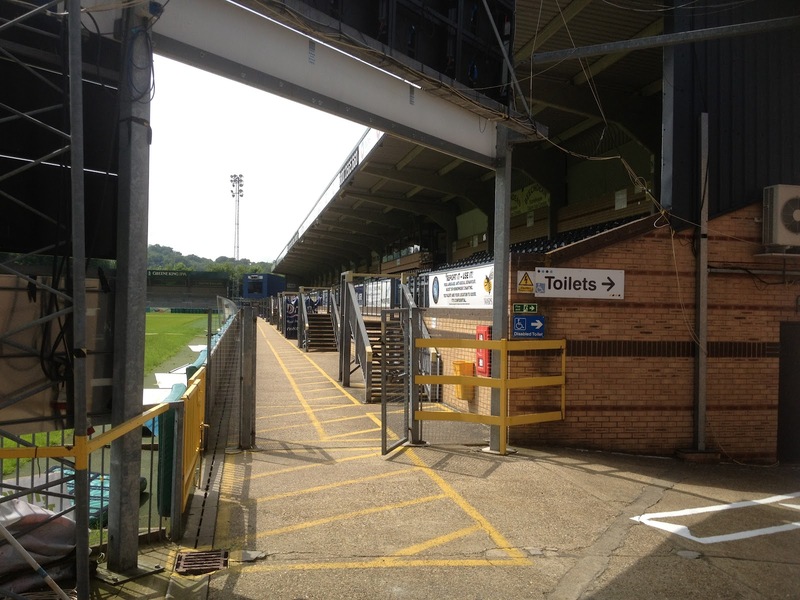 Their game against St Albans City at Loakes Park attracted a record crowd of 15,850. The big name in the amateur game of the time, Bishop Auckland ended their run in the Griffin Park semi final in front of 30,453 fans. Five years later, the same opponents ended another run at the last four stage, this time in an encounter at Belle Vue Doncaster. 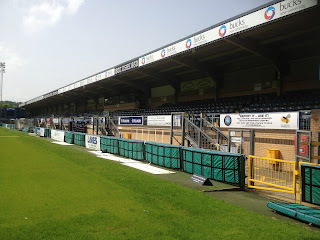 The following season Wanderers went on to win the Isthmian League title which they defended the next year as well as reaching Wembley in the Amateur Cup Final, where they were defeated once more by Bishop Auckland. 1960 saw the club reach the FA Cup Second Round for the first time, where they were rewarded with a local derby away to Watford, but also a 5-1 defeat. The sixties were disappointing as a whole until the decade came to an end when Brian Lee took over playing affairs from the old process of a selection committee. Several good players came in which led to a third Isthmian League title in 1971, which was retained the following season. In that same year Hendon dashed their hopes of a Wembley revisit as they won the Griffin Park Amateur Cup Semi Final. The club turned part time professional in 1974 in line with the rest of the game and the 1974-75 season saw Wanderers in the limelight thanks to an FA Cup run. Cheltenham Town and AFC Bournemouth were defeated before Jack Charlton's Middlesbrough arrived at Loakes Park for the third round tie in front of the TV cameras to show highlights the following day. Boro won the replay with a last minute goal in front of a gate of 30,128. Amazingly the side pulled back a defecit of sixteen points to win their third consecutive league title. Lee resigned in November 1975 as the side broke up with other clubs being able to afford higher wages. 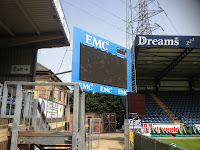 Wanderers declined to join the Alliance Premier League at its beginning and once more when they lifted their seventh Isthmian League title in 1983. Gates began to dwindle soon after but in 1985 they decided to join non leagues pinacle in the APL, later to become the Conference. In that first season they once again reached the FA Cup Third Round, beating Colchester United and Chelmsford City in home games marred by crowd trouble before going down away to York City. The season ended in relegation back to the Isthmian League. Brian Lee had returned to the club as Chairman and he realised that Loakes Park would struggle to meet the tougher ground grading requirements if they were to move forward. Also there wasn't sufficient space to develop the ground. Some quality signings were made as the club won the title once more to seal a return to the Football Conference. Unfortunately manager Alan Gane resigned as he wanted more big money signings. Peter Suddaby took over as players were sold and he soon departed. Jim Kelman led the team to a fourth place finish in 1989 but the following season was inconsistent despite many good players appearing. 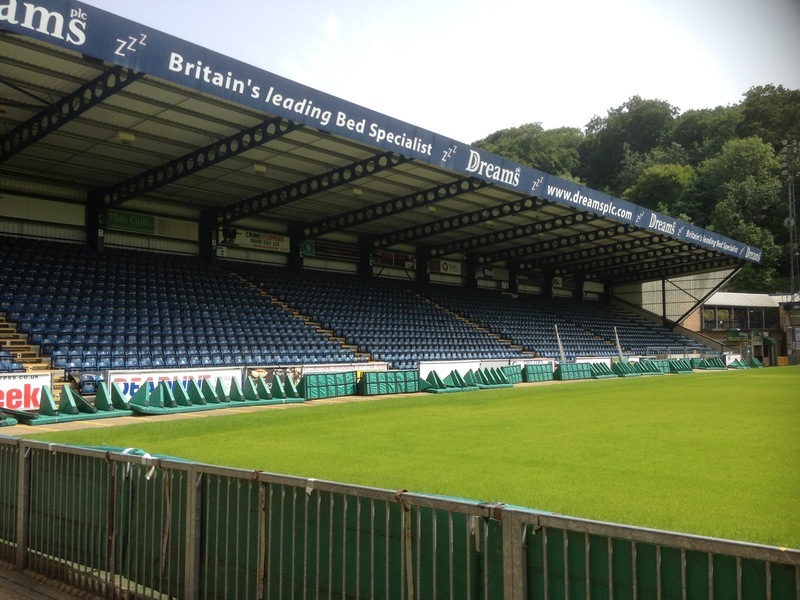 1990 was a huge year for the club as they moved to a brand new stadium called Adams Park after the man who's bought Loakes Park, and former Nottingham Forest star Martin O'Neill took over as manager. The move allowed O'Neil funds to buy players to launch a bid for promotion. He built a side containing the likes of Keith Ryan, Keith Scott and Steve Guppy which reached the FA Trophy Final, where they beat Kidderminster Harriers with Mark West grabbing the winner. The 1991-92 season saw a battle royal in the league with bitter rivals Colchester United, with the U's winning the title and going up on goal difference. Wanderers took West Bromwich Albion to a second round replay in the FA Cup the season after, but the real joy was to come in the 1993-94 season. Wycome once again reached Wembley in the FA Trophy Final, where Runcorn were defeated 4-1 but the crowning glory was the clinching of the Conference title and promotion to the Football League. O'Neil wasn't finished their. In their debut League season he added more players while Scott was sold to Premier League Swindon Town. It resulted in another Wembley visit, this time for the Play Off Final where they beat Preston North End. Despite leading the side to a near play off finish the next season O'Neil resigned in the summer of 1995 to take over as Norwich City manager. Alan Smith and then John Gregory had spells as managers, but O'Neil was a tough act to follow. Goalkeeper Martin Taylor and the returning Keith Scott strengthened the side as coach Neil Smillie took over control until the arrival of Lawrie Sanchez in February 1999 who managed to help save the side from relegation. The 2000-01 season saw Wanderers enter into an amazing FA Cup run, seeing off Harrow Borough, Millwall, Grimsby Town, Wolverhampton Wanderers and Wimbledon to reach the last eight. In the quarter final away to Leicester City Roy Essandoh who had signed after seeing an appeal on teletext for a striker just a few days before scored a winning goal to send The Chairboys to the FA Cup Semi Final. In the last four encounter Liverpool ran out two one winners at Villa Park. 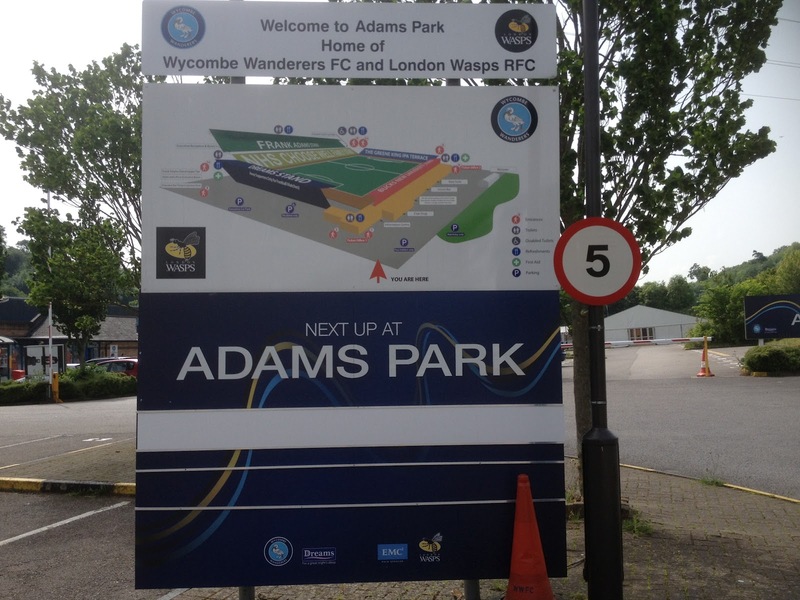 In the winter of 2002 a deal was signed with London Wasps RFC to use Adams Park for their home games. In the summer long serving star Dave Carroll was released along with many other players. Soon after it was revealed that the club was spending severely beyond their means. Sanchez was sacked in the Autumn of 2003, while the naming rights to Adams Park were sold. This was seen by many as an insult to the man who'd made so many things possible. Retiring Arsenal legend Tony Adams came in as the new manager, but he failed miserably as the team were relegated. John Gorman took over before Paul Lambert was appointed. In the 2006-07 season Wanderers went on another superb cup run, this time in the League Cup when they reached the semi finals but Chelsea proved too strong over two legs. The following season Lambert took the side to the play offs where they missed out in the semi finals. A few days later he resigned. Peter Taylor was named as the new manager who took them to promotion at his first attempt. Yet surprisingly after a poor start the following season he was sacked to be replaced by Gary Waddock. Around this time, Steve Hayes a club director who also owned Wasps took control of the club. He had earlier announced unpopular plans for a new sports village including a new 17,500 capacity stadium for both clubs to use. Waddock couldn't keep the side up, but the board kept faith and were rewarded when Wycombe were promoted at the end of the 2009-10 season. 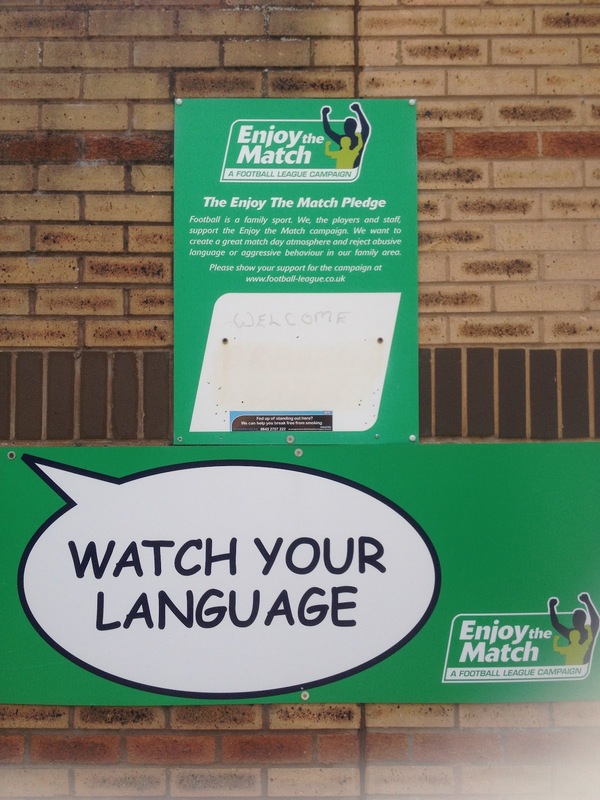 Unfortunately their spell in the League's third tier once again lasted just one season. In the summer of 2011 the local council finally blocked the sports village plans, while the clubs Supporters Trust looked at ways to be more involved. Hayes announced that Wasps were in financial trouble and looked to find a buyer, while he had more troubles of his own as he was arrested by the police and bailed until June 2012 over allegations of computer hacking. 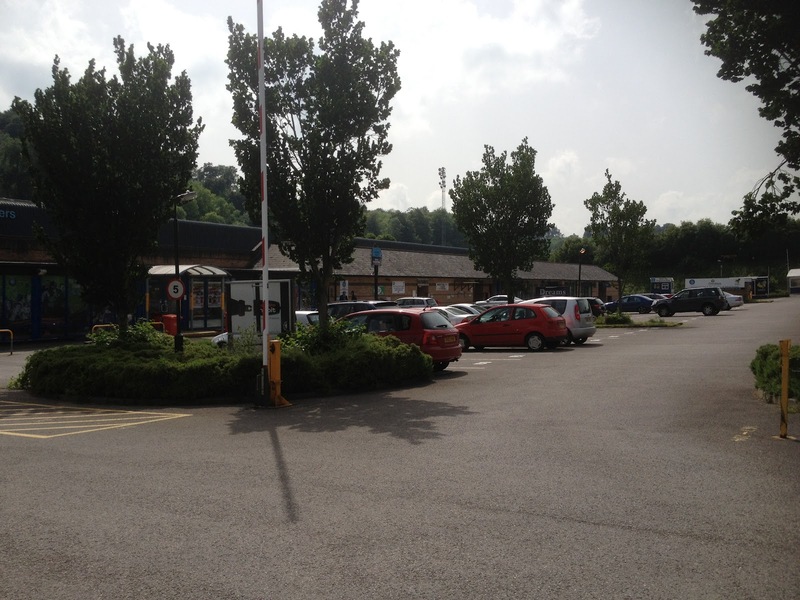 The Trust took over the ownership of the club on Friday 29th June 2012 and looked to file the accounts so an earlier transfer embargo could be lifted, while looking to run the club on a break even model. However, the new owners soon came across the harsh realities of decision making after a poor start to the 2012-13 season when manager Waddock was relieved of his duties. Gareth Ainsworth took over the reigns. 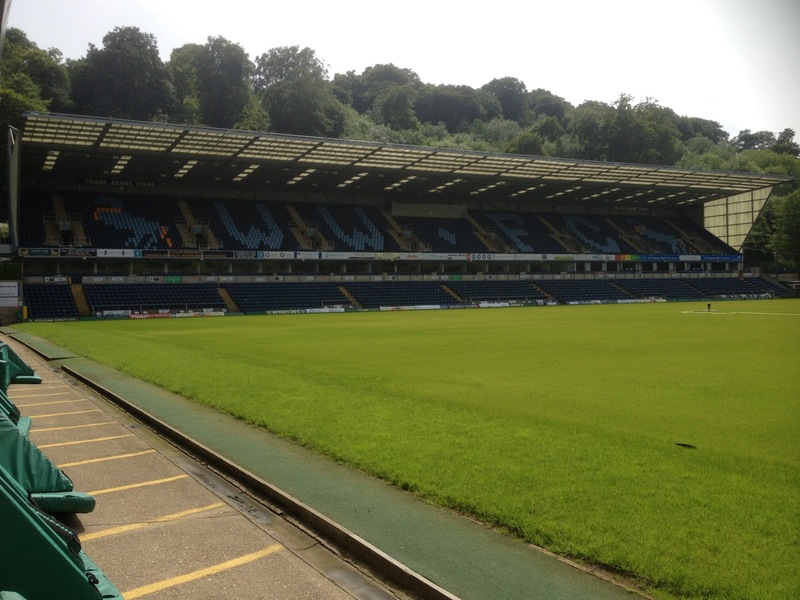 Wycombe Wanderers FC will compete in Football League Two in the 2013-14 season. I had moved down to live and work in London a few months earlier and my summer season at Lord's had finished. With my Saturday's free I decided to take in some new venues. After looking at the fixtures a visit to High Wycombe seemed in order. I got a call from my Dad as I walked through the town centre to let me know Scarborough were to be saved by a new owner called Brooks Mileson. It seemed very promising at the time, but how little I knew! I continued to the pub in good spirits where I had a chat with some visiting Blackpool fans. 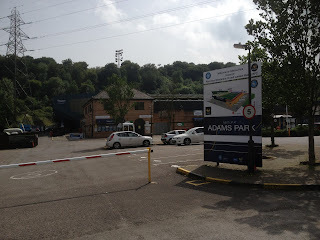 I found the bus station and caught one of the matchday special buses to Adams Park, as it was located in Sands, quite a way from the town centre. I had heard from pals who'd visited with Boro that they had a strict policy on getting into the clubhouse at the ground, but I decided to try my luck anyway. I explained to the doorman that I was a neutral. I had my badge on, and he smiled and welcomed me in, adding I was fine at full time as well. 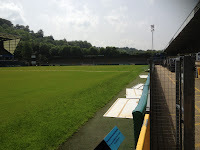 I took my place on the medium sized covered terracing behind the goal. 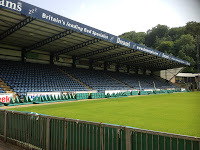 Opposite was a seated stand of similar size for the away fans. To my left was the Main Stand. This was a raised seating deck with flat standing in front. 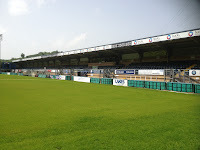 Facing it was the Frank Adams Stand. Thsi had previously been the same size as the other structures for standing spectators. It was now seated, with another large tier behind it making it the stadiums' stand out feature. Blackpool had started the game near the basement of the division with the home side in mid table, but the visitors were first class and fully deserving of their win, with David Lee the stand out man. At full time I left with haste to catch a bus back as I figured the queues could be long and the traffic bad as Adams Park was sited right at the end of a narrowish road at the end of an industrial estate. The same Blackpool fans I spoke to in the pub also got on board in jubilant mood. I headed back to the station and caught a train to Wembley Stadium to walk past the sad sight of the old place awaiting its final year in action on my way to Wembley Park station and the tube home. I had the day off work and having completed a morning jog and the sun shining I decided an afternoon out to visit some grounds was in order. I'd taken the tube, a train and a bus to my previous call at Holmer Green before taking another bus to High Wycombe bus station. 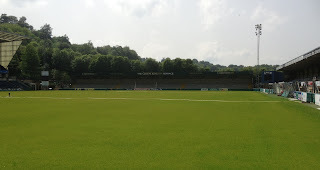 I had considered walking to Adams Park to take some photos, but I'd done plenty of leg work so I bought a return ticket to The Hourglass for the bus that was expected shortly after. I must have looked lost as I followed the route on my map, as a lady dressed in her Asda outfit asked where I was going. She told me when to get off and where my return stop was, before pointing out the road I needed to reach the ground. It was about a fifteen minute walk along Lane End Road to the industrial estate and then up Hillbottom Road. There were several cars in the park at the rear of the Main Stand, which showed promise of activity and hope of gaining admission. 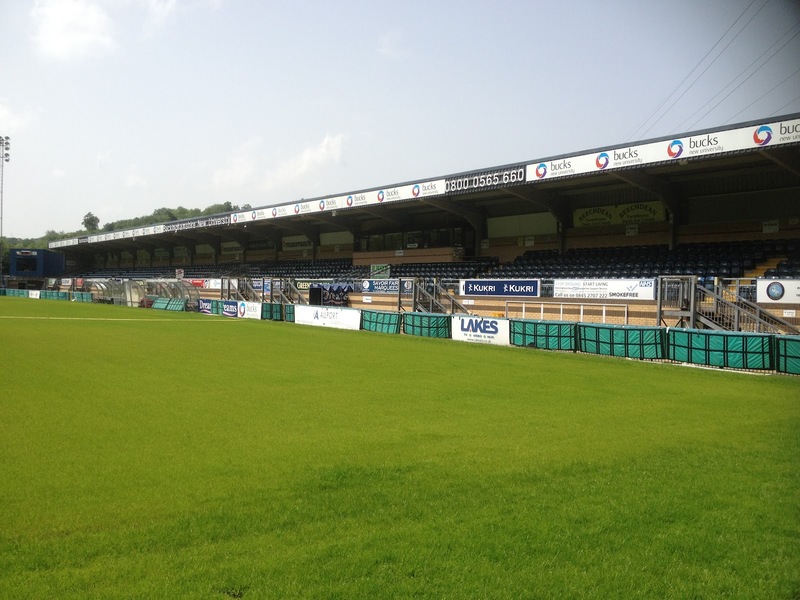 The stand had several additions at the rear for offices and hospitality as well as marquees to serve thirsty fans. 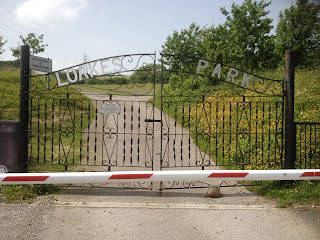 The old gates from Loakes Park were there, which was a nice touch. I saw an open gate in the corner by the stand and the seats behind the goal, so in I went. The pitch was looking lush and been left to grow. The only change from my previous visit was that the seated stand behind the goal had been extended in height. I departed and walked back on the same route. My bus soon arrived to take me back to town, where within minutes I was on another one to Flackwell Heath. Incredibly, their Wilks Park home was completely locked! Although it had been a wasted journey I'd still had a great afternoon out. The weather was stunning and I'd got my pictures I really wanted. I took the train to Wembley Stadium and walked to the Wetherspoons for a couple of refreshing drinks before heading home a contented man for a meal and to joyfully see my bet get one stage nearer to completion as Italy beat Germany in the Euro 12 Semi Final.